Janelle and I grew up together in a small town in Connecticut. We dated while we were younger and were reunited in 2013 when Janelle moved out to San Diego, CA. In March 2014, we decided we wanted to take a vacation. My best friend was getting married in Boston that September, and we both thought it would be nice to take a short vacation afterwards. We talked about several places, and ultimately decided on London. Janelle had never been to Europe and we both thought it would be a great place to start. I told Janelle I had booked the tickets to London and that everything was all set for our trip. What Janelle didn’t know was that we weren’t really going to London. 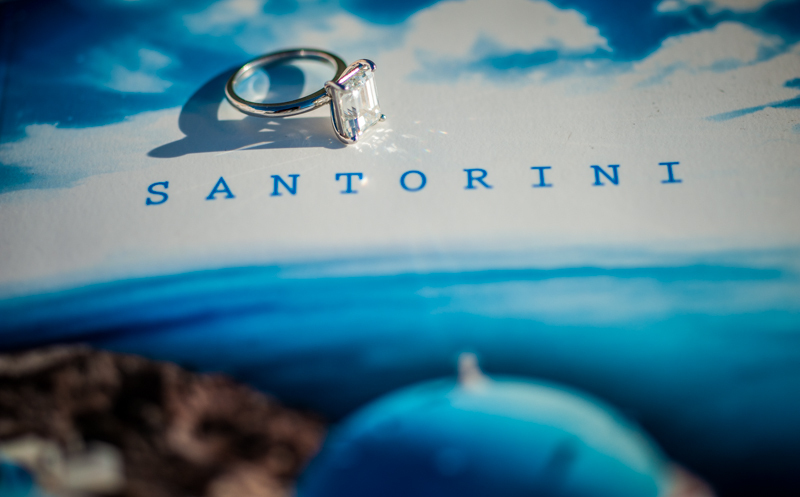 I had planned a surprise proposal trip to Santorini, Greece. Janelle had always wanted to go there and had been texting/emailing me pictures of the island asking if we could go for our honeymoon some day. 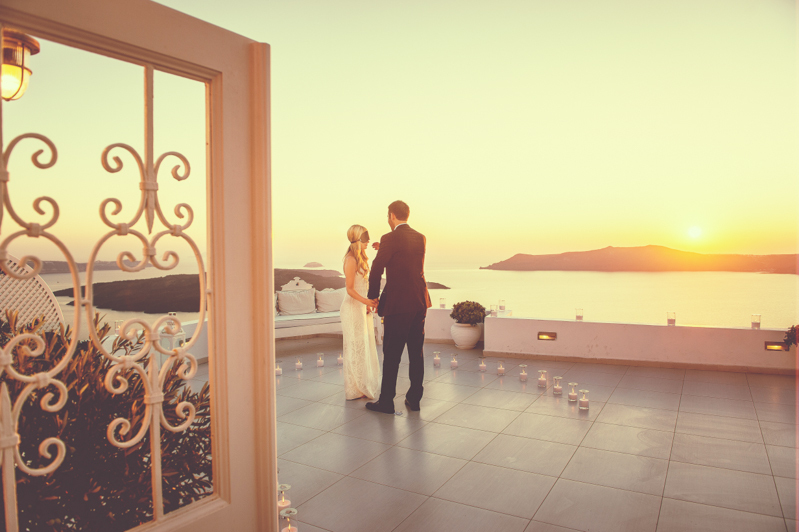 I reserved a beautiful private villa (myblue) in Oia right next to the famous blue domed churches. 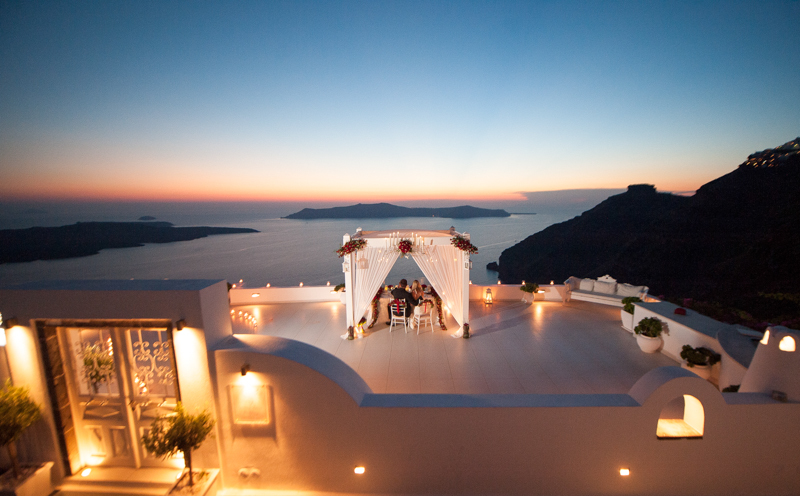 I also reserved a private dinner for two at the Dana Villas resort, the most popular wedding venue in all of Santorini. I emailed the Dana Villas manager, Gianni, and asked if he could help arrange a walkway of candles from the entrance door to our private dinner table overlooking the ocean. Gianni thought this was a great idea and we discussed the costs associated. The next day I received an email from, Panos, the owner of Dana Villas. 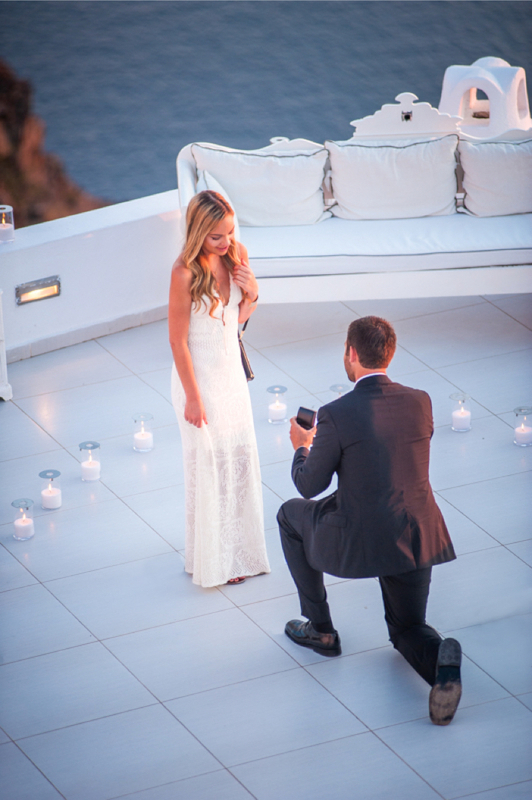 Panos said he was extremely excited that I had chosen Dana Villas to propose. He said really liked my proposal idea and offered to help me make it even better. 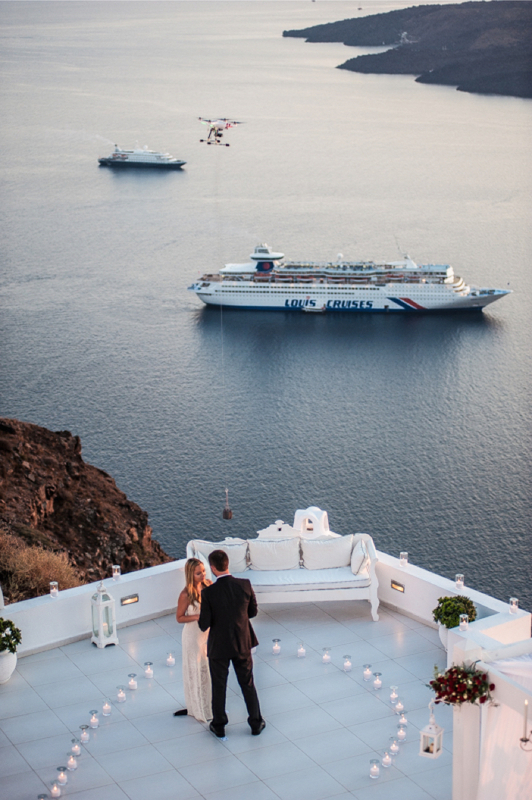 He said he wanted to hire Studio Phosart, the best film crew in Greece to capture every detail. He offered to film the entire proposal (Studio Phosart), hire professional photographers (Studio Phosart), professional florists, fireworks etc. I had to pinch myself several times while reading his first email. I couldn’t believe it was real. 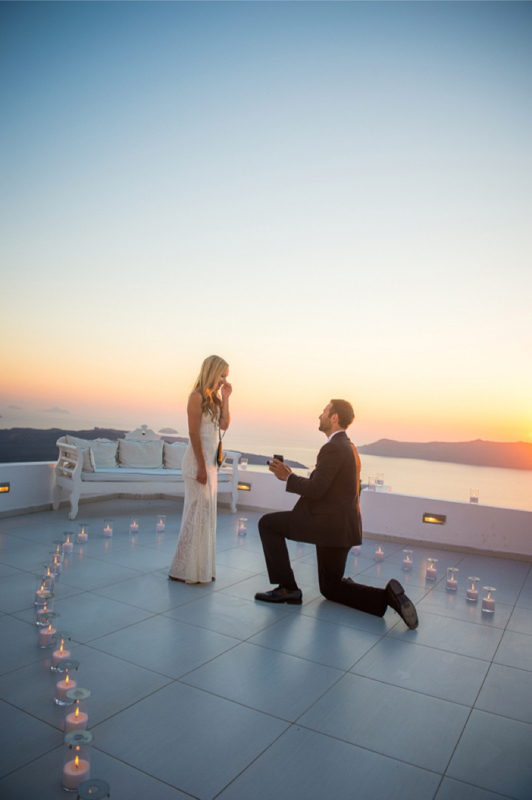 For the next few weeks, Panos and I emailed back and forth secretly planning the perfect proposal. For the next three months I told everyone including our friends and family that we were going to London. I even printed out fake airline tickets. We headed for “London” on September 7th, the day after my friend’s wedding. When we arrived at the Boston airport, we walked towards the gate that said “London Departures”. As we approached the gate, I pulled out my camera to take a video. I said, “Babe, we’re not going to London”. Janelle turned around with complete confusion and said what are you talking about? 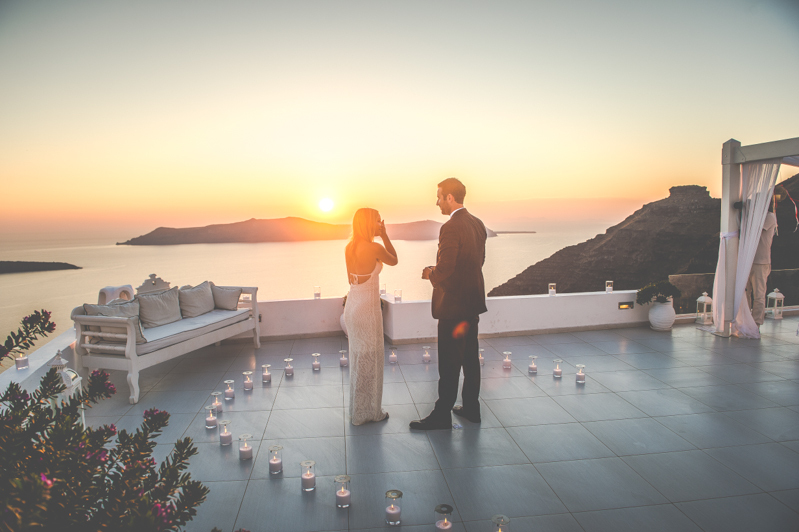 I told her I had planned a surprise trip for us and that we were going to Santorini. She hugged me tightly, and started to cry. She couldn’t believe it! 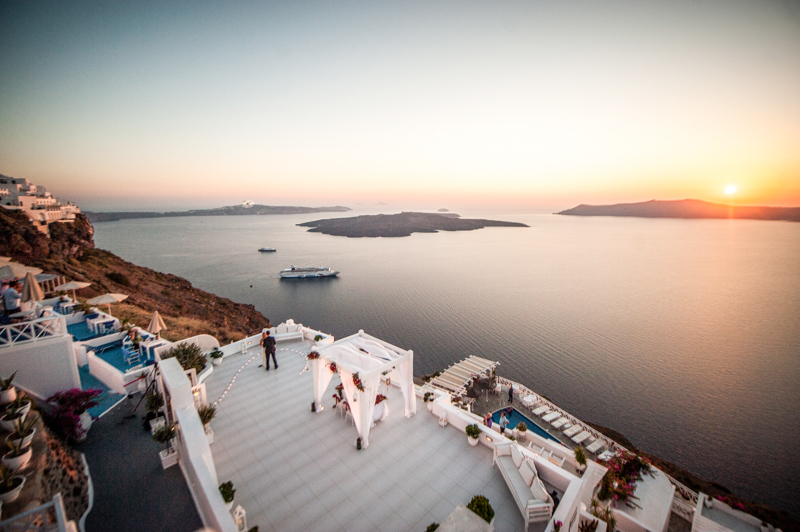 When we arrived at the Santorini airport (Tuesday afternoon), there was a taxi driver (Panos) holding up a sign reading “B. Meyers”. We walked up to him and he guided us to our taxi. It was a very nice black Mercedes van. There was a GoPro video camera hidden in the sunroof and a tray table in front of the back seat. Panos opened the side door and we jumped into the back seats. He pushed a button on the tray table in front of us, and a bottle of champagne popped into the air. 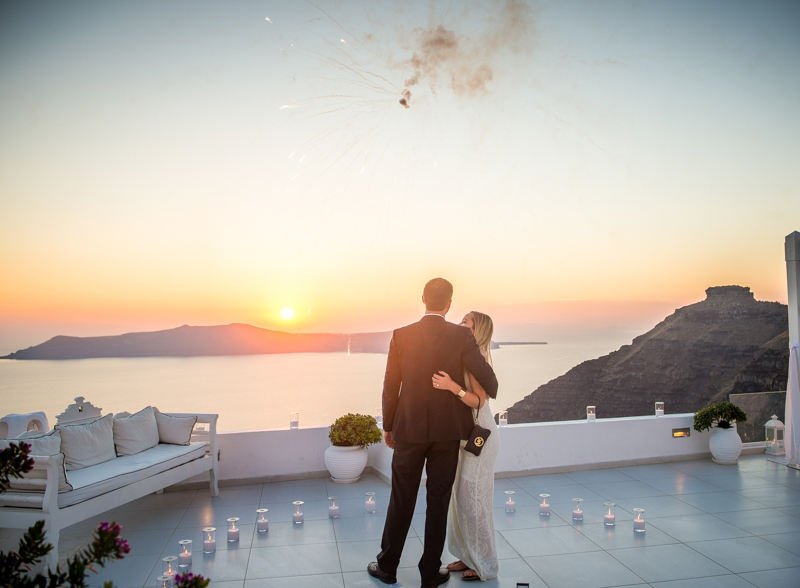 He poured us two glasses of champagne, and said welcome to Santorini! Panos hopped into the driver’s seat and headed towards our private villa. On the way he stopped at one of the most photographic spots on the island. 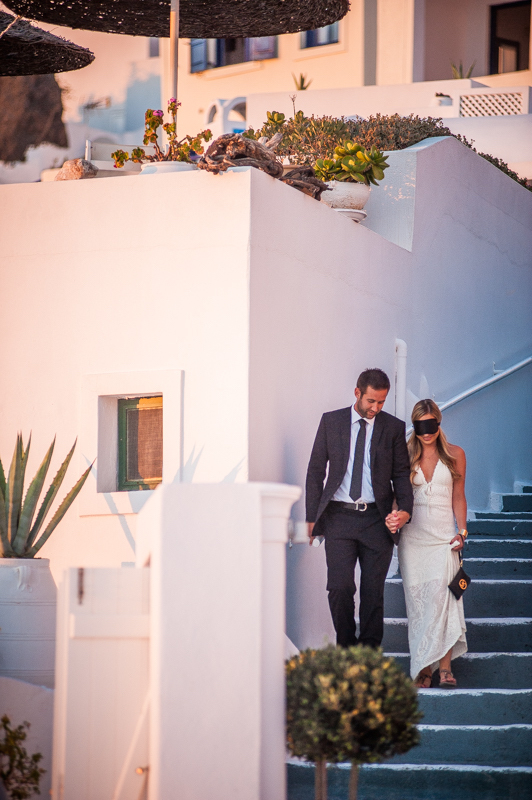 He took a few pictures of us, and then we headed to our villa. Note: The Studio Phosart team was secretly filming and photographing us from the moment we landed until we arrived at our villa. They were unnoticeable and Janelle had no idea! The proposal was scheduled for Thursday night. 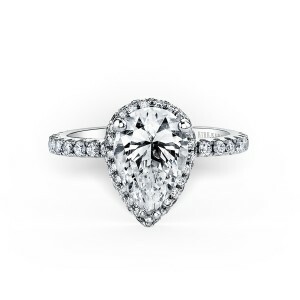 On Wednesday night, I received an email from Panos asking if I could give him the ring sometime Thursday morning. I told Panos that Janelle and I were spending the day in Fira (the capital of Santorini) and that I could meet him by the large church. 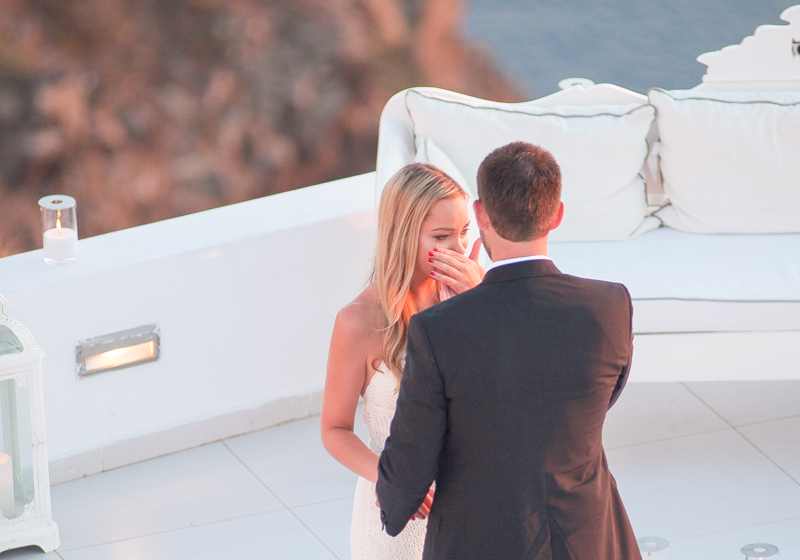 After Janelle and I arrived in Fira, I secretly snuck off to meet Panos and gave him the ring. Panos was excited and said I have something excellent planned for you tonight! He asked me to wear a suit jacket, to bring a pair of scissors, and a blindfold. He said he would pick us up from our villa at 6:50pm in the same Mercedes van. I secretly bought a sleep mask (blindfold) while Janelle was shopping in Fira. I already had a suit jacket and pair of scissors back at the villa. 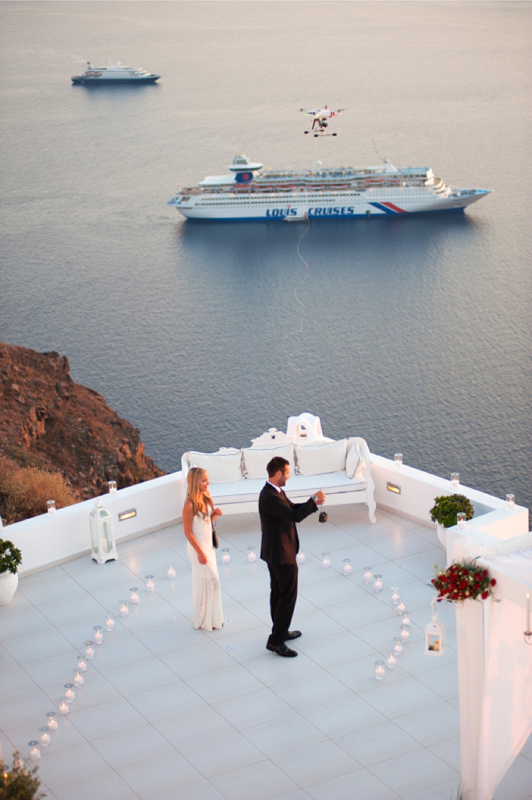 After we returned to our villa from Fira, I told Janelle that we were going out to a nice dinner. She put on a long white dress and got ready for dinner. I hid the sleep mask and scissors inside my suit jacket pocket while she was getting ready. Panos picked us up outside our villa at 6:50pm. He opened the side door and popped open another bottle of champagne. We then headed to Dana Villas which was about 15 minutes away from our villa. Again, the GoPro camera was hidden in the sunroof. When we got to Dana Villas, I asked Janelle to put the blindfold on. She was hesitant at first, but after some negotiation she finally agreed. After putting the blindfold on Janelle, I handed Panos an IPod playlist of our favorite songs and a camera man from Studio Phosart secretly clipped a microphone on to my suit jacket. I then proceeded to carefully walk Janelle down over eighty steps with her blindfold on. The camera crew from Studio Phosart was secretly taking pictures from every angle click, click, click. At about the half way point, the music went on and began playing our favorite song. As I looked up, I saw dozens of people scattered all over the caldera watching us from above. I thought in my mind, “She’s going to kill me”. When we got to the bottom of the stairs there were a number of candles perfectly placed into a semi-heart shape. Panos secretly pointed where Janelle was supposed to stand and where I was to propose. Once we were in position (facing each other), I told Janelle she could take the blindfold off. She took the blindfold off and immediately started crying at how beautiful everything was. It was like a dream. covered in flowers, everything was perfect. 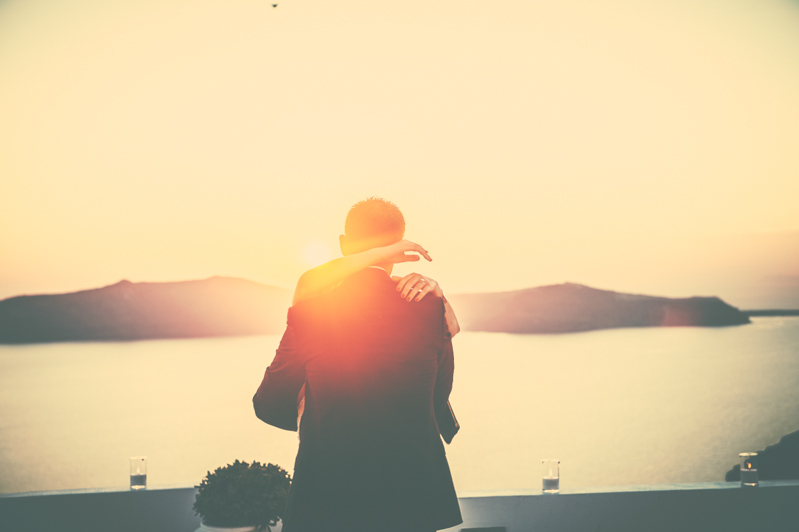 I held her hands, and soft music was replaced with a slight buzzing noise above my right shoulder. I looked up and saw a robotic helicopter (drone) flying above my head with a long clear fishing line attached. At the bottom of the fishing line, there was a cloth bag floating just a few inches from my hands. I pulled out the scissors hidden inside my suit jacket, cut the line, and grabbed the cloth bag. I opened the bag and saw that the ring was inside. 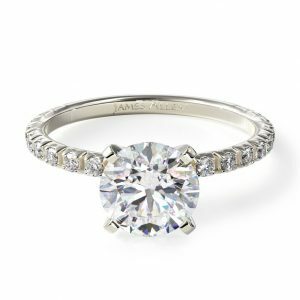 I got down on one knee, told her how much she meant to me, and asked her to marry me. She said yes! After the proposal, one of Panos’ crew members handed me a giant bouquet of roses. I gave them to Janelle and kissed her. After this, Panos waved his hand in the air and an incredible firework show went off. It was truly unbelievable. 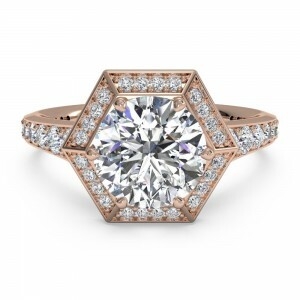 After the fireworks, I told Janelle there was one last secret. The guy who picked us up from the airport and gave us a ride to Dana Villas wasn’t really a taxi driver. 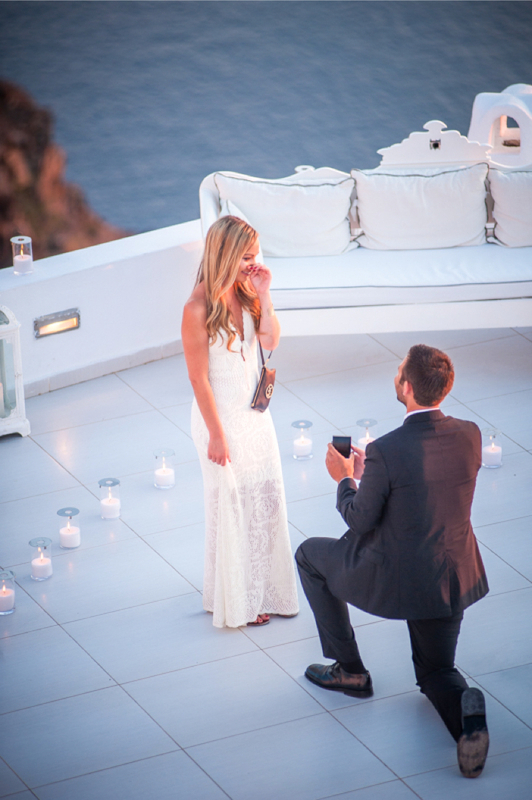 I said he was the owner of the resort and told her how he and Studio Phosart had helped me put this entire proposal together. She couldn’t believe it. Panos then came out and re-introduced himself. Every last detail was perfect! As the sun went down, Janelle and I had an amazing private dinner overlooking the ocean. It was a truly a dream come true! I am forever indebted to Panos and the Studio Phosart team for helping me create, and capture a perfect proposal beyond anything I have ever dreamed of.